Seniors have more driving experience on the road than most drivers. They've had decades of driving practice, presuming they've been driving since their young adult days. As mature drivers, they're typically not emoting while driving because their girlfriend broke up with them. They're not hurrying to get kids to school on time, speeding through school zones to get to work on time, or rushing to pick up kids from daycare before the late fees kick in. Senior drivers typically don't talk on the cell phone or text while driving. They're not usually racing through a yellow traffic light to beat the red stop light. And, from the wisdom of age comes a bounty of benefits! Many auto insurance companies offer discounts regardless of age. For example, discounts for a good driving record, bundling homeowners and auto policies, customer loyalty programs, and payments in quarterly or annual installments are typically offered to all drivers. Discounts for vehicles with high safety ratings, crash protection features, and anti-theft devices are usually available as well. Some insurance companies offer special discounts just for being a senior driver. Seniors who drive with low mileage, less than a specified number of miles per year, may find significant premium savings. Retirees who are at least 55-years-old and retired military personnel often get extra discounts. Membership in senior organizations such as AARP may bring additional savings. Some states, like Florida, mandate car insurance discounts for completing senior driving safety courses sanctioned by the state's Department of Motor Vehicles (DMV). Check with your state DMV to see if your state offers this type of program for seniors. The convenience of being able to drive yourself where you want to go, when you want to go there is an important quality of life factor for many seniors. Arranging for a driver or using a bus system to get around town, go shopping, or get to various appointments can be a hassle. Not to mention the expenses associated with upscale driving services like taxis or shuttle services. Can Seniors be Denied Auto Insurance? The simple answer is no. That's as long as your state hasn't barred you from having a driver's license, usually due to certain medical conditions, impaired driving convictions, or otherwise causing too many accidents. Some insurance companies may offer car insurance to seniors with significantly higher rates for lesser offenses. A high number of traffic citations or other risky driver indicators will often trigger higher premiums. If you're a senior and have auto insurance, check your policy and look to see if any senior specific discounts were applied. Shop around, get quotes from other insurance companies, and compare senior discount rate offerings. These days, it's easier to find car insurance rate and policy comparisons on the web. About the author : Dennis Gilroy is a professional insurance representative. He enjoys sharing his expertise on the topic through blogging. 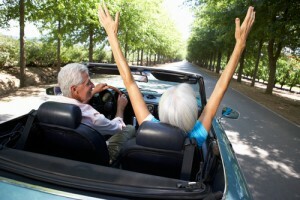 Check out http://www.autoinsurance.us/ website for more information about car insurance policies and discounts available for seniors. Awesome post I have ever read. Age is the most important factor for insurance. The older you are the cheaper your car insurance will be. Car insurance companies use statistical analysis to calculate how much you will have to pay. Their calculation states that the older an individual is, the less likely he is to have an accident since he drives more carefully overall. In other words, it is less likely to have an accident, as one is older, since he/she is very well aware of the fact that they have lesser/fewer number of years left to continue driving your car. Insurance is very important for senior drives as risk is more with them on road. You have shared very Useful things for keeping in mind for seniors insurance.